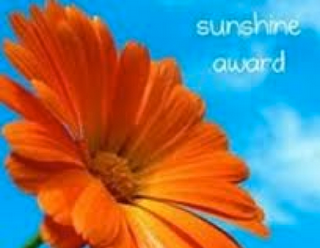 I've been nominated for the sunshine award! The lovely Natalie from Yours Truly, NY nominated me for this award, and Natalie, if you're reading this, thanks so much! This tag has lots of questions so I'm going to get into it. 4) Make up 11 questions for your nominees! 2) California is my favorite state in the US, hands down! 8) I love reading People magazine and Us Weekly, but I never get to unless I'm at the hairdressers! Natalie also made up 11 questions for me that I'll answer here! 1) What is one of your bad habits? Touching my face a lot! Its so bad because it spreads germs and all that, but I do it unconsciously all the time! 2) Would you rather be happy and poor, or rich and unhappy? 3) Name a pet peeve! I hate when people chew loudly and I can hear it! Its so gross! Iced Skinny Caramel Machiatto from Starbucks! Ian Somerhalder... and I don't even watch the vampire diaries! 7) Pick one that you collect the most: Shoes, bags, makeup, nail polish, jewelry, or sunglasses? 10) How long does it take for you to get ready in the morning? 11) Favorite book at the moment? I just finished reading the Great Gatsby for school, and it was amazing! Totally a classic that everyone needs to read! So if you'd like, you can stop reading this post right now because the rest of it will be my nominees and my questions for them, but if you'd like to keep reading, go ahead! So to the gals that I just nominated... here are my questions for you! 1) Holy Grail makeup product? 2) What's your favorite part about blogging? 4) Do you like to play up your eyes, lips, or other part of your face? 5) Favorite color to wear? 7) Do you change the colors you wear based on the season? 10) Favorite part about fall! 11) All time favorite movie? So thanks for sticking through this crazy long post you guys! I hope you enjoyed learning about me and if I didn't nominate you, you can still answer these questions in a comment or something and that would be great because I would love to hear what your answers are! Thanks Diana! And no problem! I love your blog so much and you totally deserve this award too! Thanks so much Sofia! I'll follow your blog on bloglovin too! Thanks Natalie! I know! Sushi is like the best food ever!